* Fast wireless charger is compatible for both 10W and 7.5W. * 2-Coil Fast Charging:Wireless charger with 2 built-in high quality coils offers a wider charging area for VERTICALLY & HORIZONTALLY wireless charging, resulting in a 1.4 faster-charging speed. No charging blind zones. 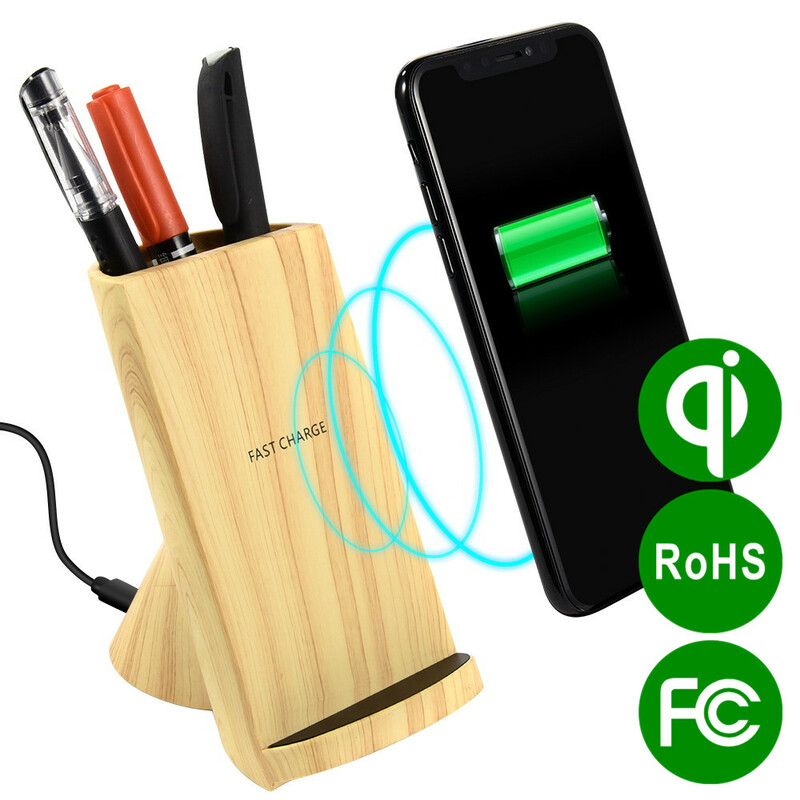 * Practical Phone Stand & Pen Holder:Wireless charger stand makes it easily receive calls, watch videos and play games without having to unplug. The smooth plastic body with wood grain design looks gorgeous. 60 degrees ergonomic designed wireless charger offers a best viewing angle. * Safety Charging Protection:The wireless charger is approved by FCC, RoHS and CE. Over-voltage, over-current and short-circuit protection will ensure safety. * Wide Compatibility: Wireless charging pad stand can charge for almost all Qi-enabled devices, fast charge mode available for Samsung Galaxy S9/9Plus/Note 8 S8 /S8 Plus S7/S7 Edge S6 Edge Plus Note 5 Series. Standard charger mode for other Qi-enabled devices such as iPhone 8, 8 Plus, iPhone X, LG V30, LG G6. Phones without QI function need a receiver (not included).